I got home at 3.30am on Monday morning after an amazing journey up Minus One Buttress on Sunday March 7. Iain Small and I climbed the first four pitches of the summer route North-Eastern Grooves (VS) and then continued up the overhanging corner system of Subtraction (E1). We started climbing at 7.30 am and reached the crest of North-East Buttress eight pitches later. We were down at the CIC Hut by 10pm and after a welcome brew (thanks Colwyn!) we were back at the car at midnight. The first three pitches were the same as the legendary route Minus One Buttress (VII,6) that was first climbed by Arthur Paul and Norrie Muir in April 1974. To my knowledge this route has only been repeated twice and was last climbed in February 1988 by Alan Shand and George Armstrong. Robin Clothier, Chris Cartwright, Dave Hesleden and I were climbing Astronomy at the time, and seeing George and Alan on the great plum of Minus One Buttress, we turned left at the top of Astronomy and headed down North-East Buttress. We climbed the first two pitches of Minus One Buttress, but a rapid thaw set in that afternoon and the neve turned to mush so we had to abseil off. 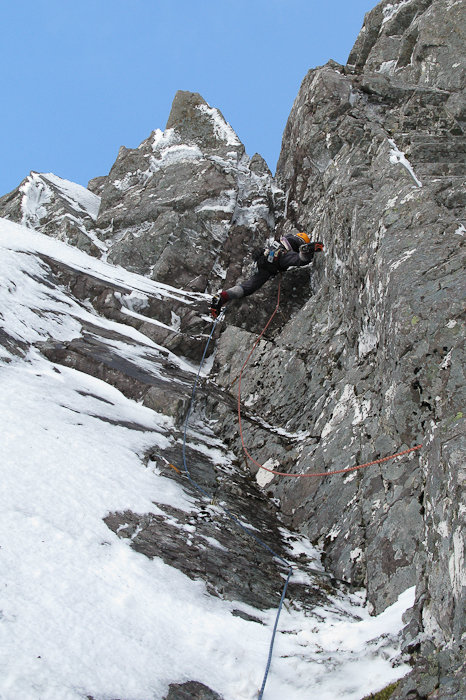 Minus One Buttress has not been climbed since in winter, so it was a great privilege to climb it by any route. The lower pitches are a VII,6 Nevis thin face climb in their own right, and to follow this by heading up the great Subtraction groove later in the afternoon felt pretty out there. Overall the route weighed in at VIII,8 and hats off to Iain for an outstanding lead of the daunting crux pitch. We called the route Integration because it links together two great summer lines into a composite whole, and integration is more difficult than subtraction! This entry was posted in New Routes and tagged Ben Nevis, Iain Small, Minus Face, Simon Richardson. Bookmark the permalink.